President Trump congratulates a U.S. Naval Academy midshipman Friday in Annapolis, Md. Trump said, "We're talking to them now. They very much want to do it. We'd like to do it. We'll see what happens." Friday evening, Trump reiterated those sentiments on Twitter, writing that "we are having very productive talks with North Korea about reinstating the Summit." Asked by a reporter whether North Korea was playing games with him, Trump responded that "everybody plays games, you know that better than anybody." Trump seemed pleased by the conciliatory tone of a North Korean statement issued after the summit was canceled Thursday, saying Pyongyang was "willing to give the U.S. time and opportunities" to reconsider talks "at any time at any format," according to The Associated Press. Trump tweeted that it was "very good news to receive the warm and productive statement from North Korea. We will soon see where it will lead, hopefully to long and enduring prosperity and peace. Only time (and talent) will tell!" Defense Secretary James Mattis also sounded an optimistic note, telling reporters at the Pentagon there is "possibly some good news" about the summit, saying that "if our diplomats can pull it off," the meeting may be back on. Mattis called the maneuvering "the usual give-and-take" of trying to put together big summits. 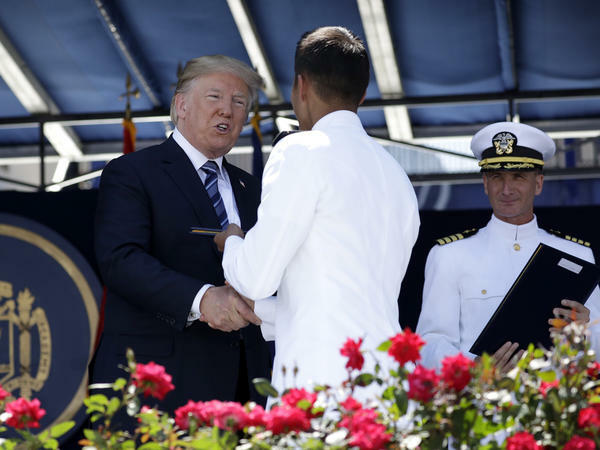 Trump made his remarks on the South Lawn of the White House before boarding Marine One for the flight to Annapolis, Md., where he delivered the commencement address to graduates at the U.S. Naval Academy. Trump didn't mention North Korea during what, at times, sounded like a campaign speech. He took credit for increasing defense spending, saying, "We have begun the great rebuilding of the U.S. military." He also said, "Our country has regained the respect that we used to have long ago," declaring, "America is back." Trump said he was going to remain after his speech to shake the hand of each of the 1,042 members of the graduating class.